When you add a Rhino license to the Zoo, you are asked to validate the license online. Rhino licenses must be validated before they can be used. Critical: If you are upgrading to Rhino, keep track of which previous version license key you used to upgrade. You can only use each previous version license key once. 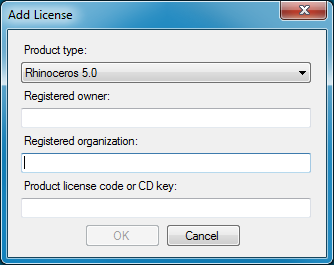 The only piece of information used during license verification is your license key, which is included when you buy Rhino. Registration is not required, nor is any personal information. No computer-specific information, or information derived from your computer is sent to Robert McNeel & Associates. To add a license to the Zoo, run the Zoo Administrator (ZooAdmin.exe), and then click Edit → Add. Select your Rhino product from the drop down list. Enter the registered owner and organization of the product. Click OK to begin license validation.